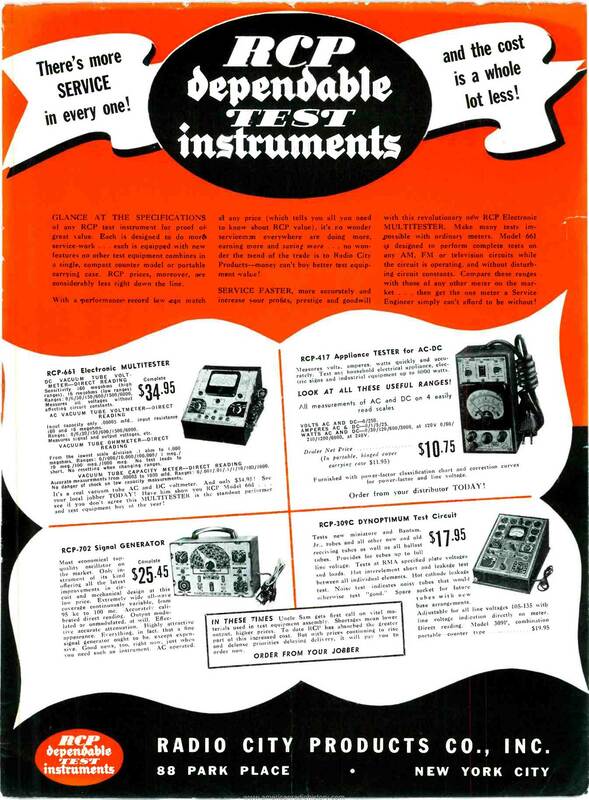 Alan Douglas wrote a book called Tube Testers and Classic Electronic Test Gear. 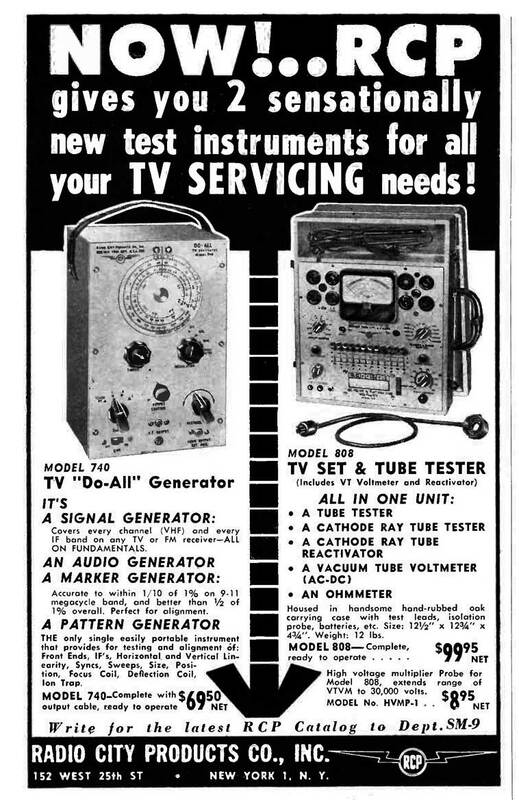 It's a good book but there is no mention of a particular supplier of test gear, Radio City Products. 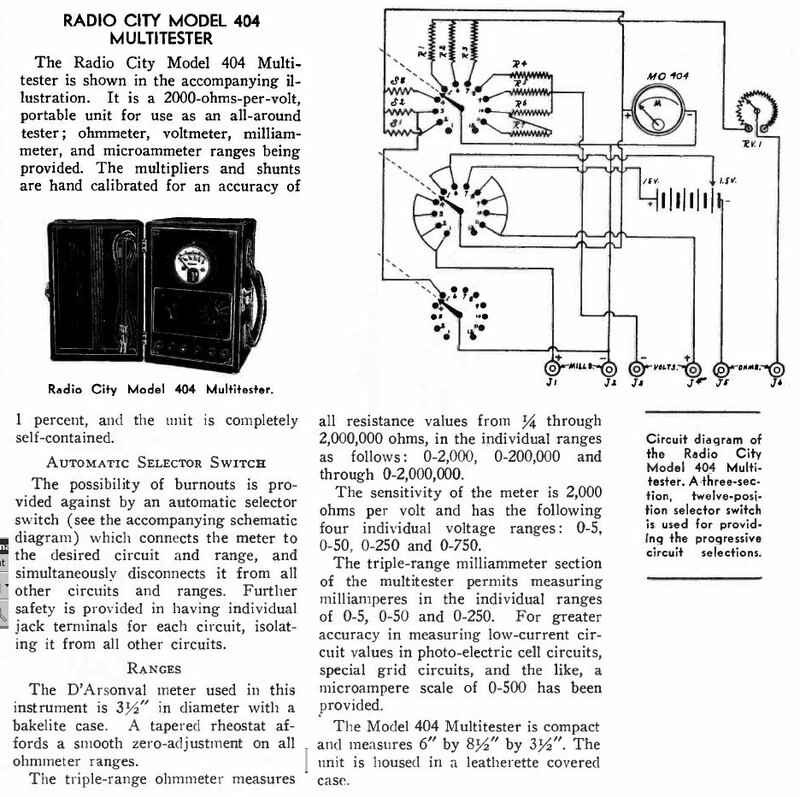 I have Middleton's Test Equipment Circuit Manual, which has schematics for a variety of devices and manufacturers, and it doesn't have any Radio City products either. 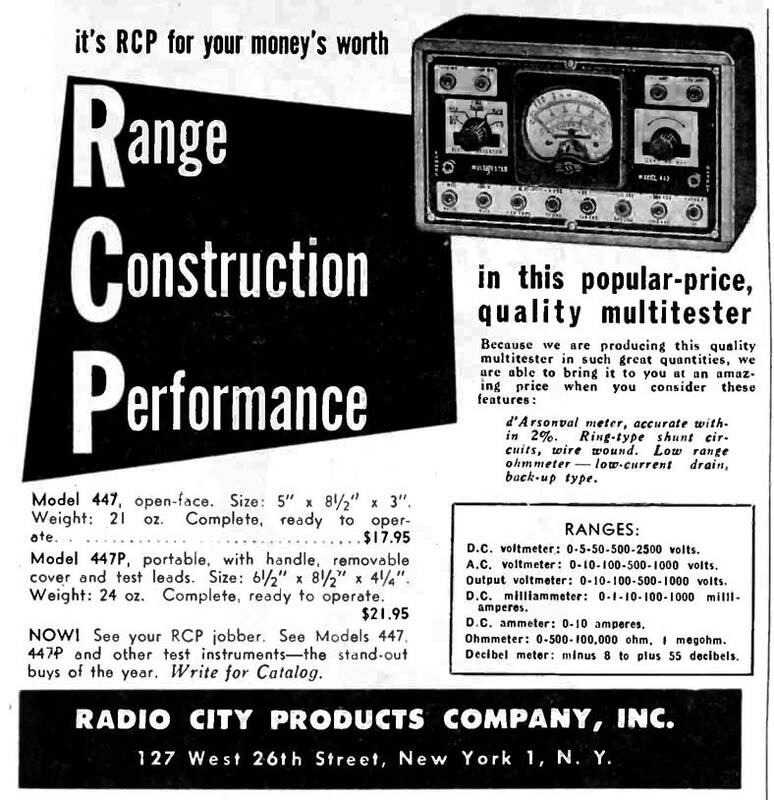 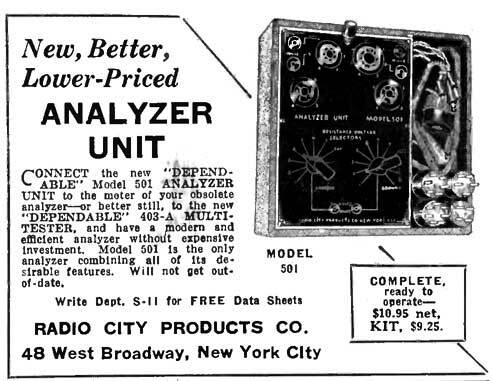 Radio City (they referred to themselves as RCP) made a slew of test gear between the 1930s and the 1950s, and enough of it survives that I thought it deserved documentation. 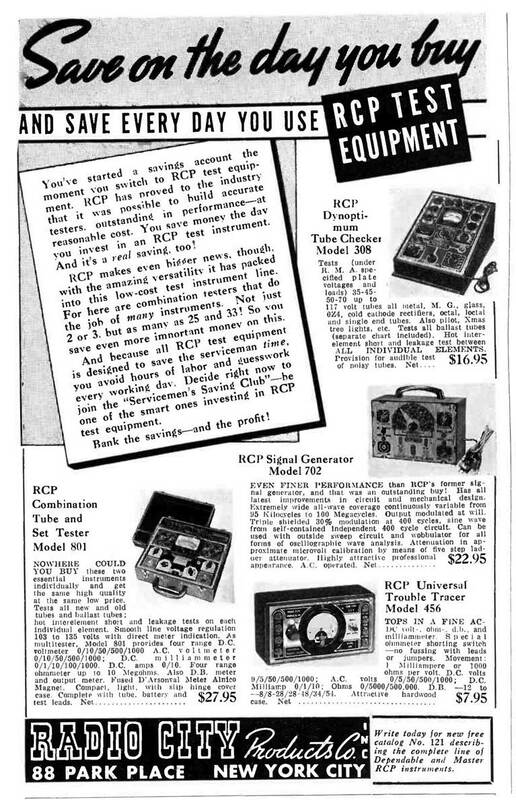 This was originally going to be an article for the SCARS newsletter, but because nearly all of my information comes from advertisements and blurbs in magazines, there's not enough to make a decent article; but it makes a perfectly good directory here. 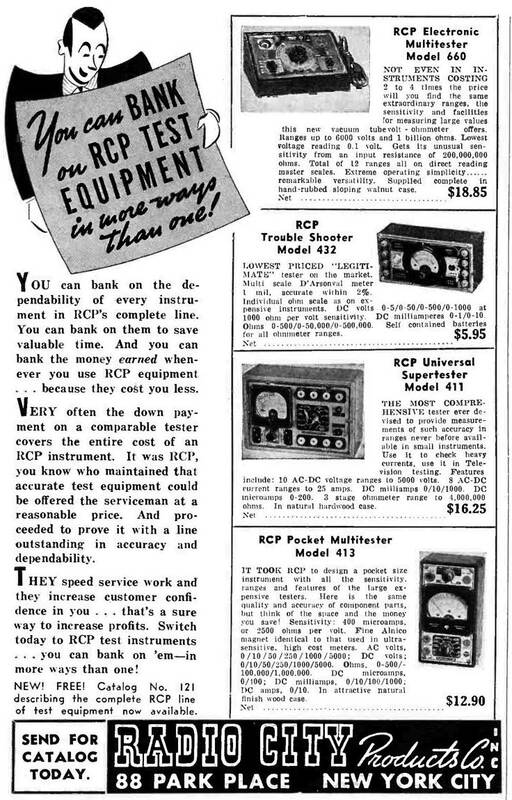 RCP made a slew of equipment, yet there's very little information that I've been able to gleen from anything other than their own advertising or short descriptions that usually appeared in the "New Products" sections of magazines; the latter were typically taken from press releases written by the manufacturers themselves. 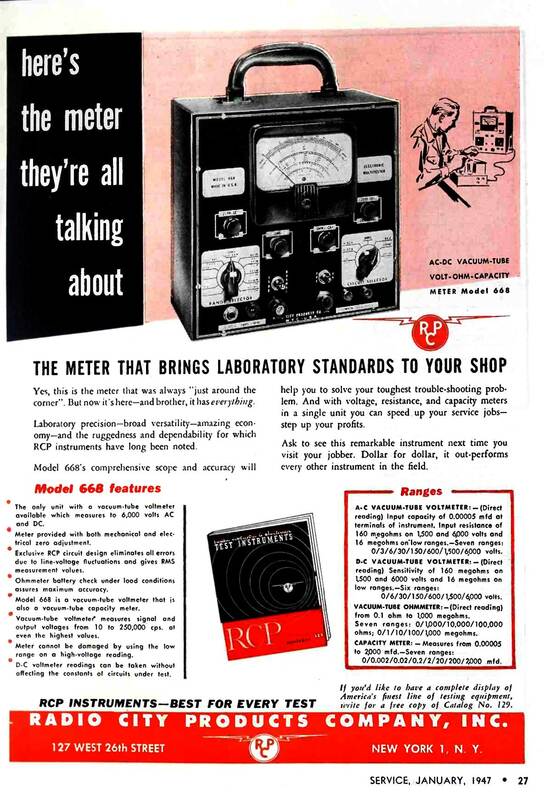 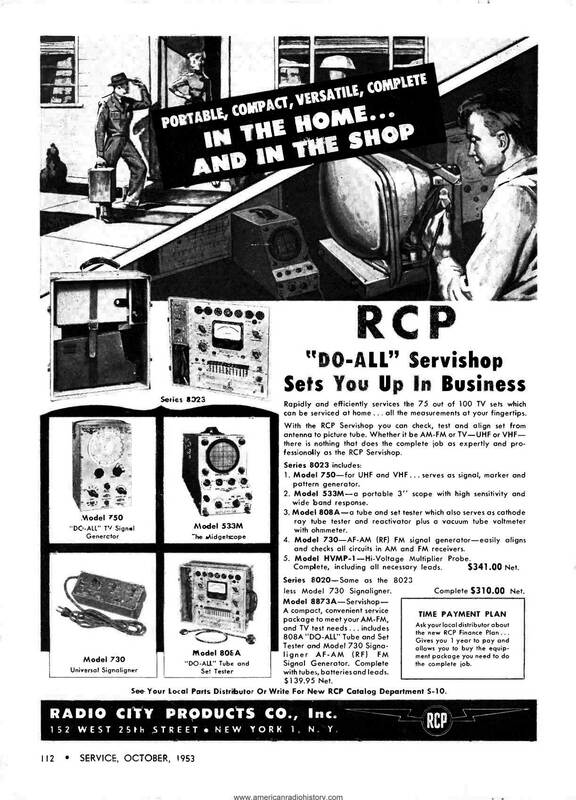 RCP advertised heavily in Service magazine, and is mentioned sometimes in Radio Service Dealer. 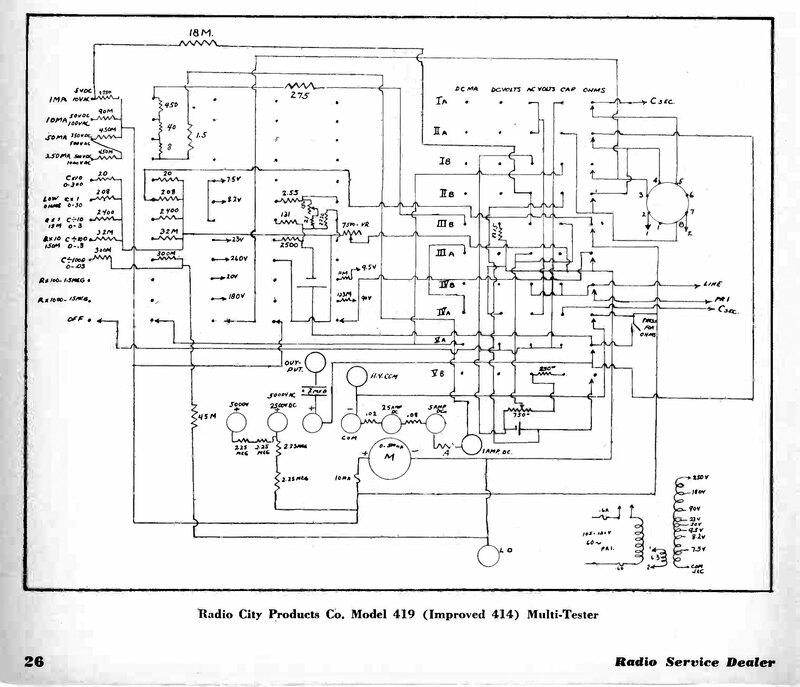 Those are my main sources below. 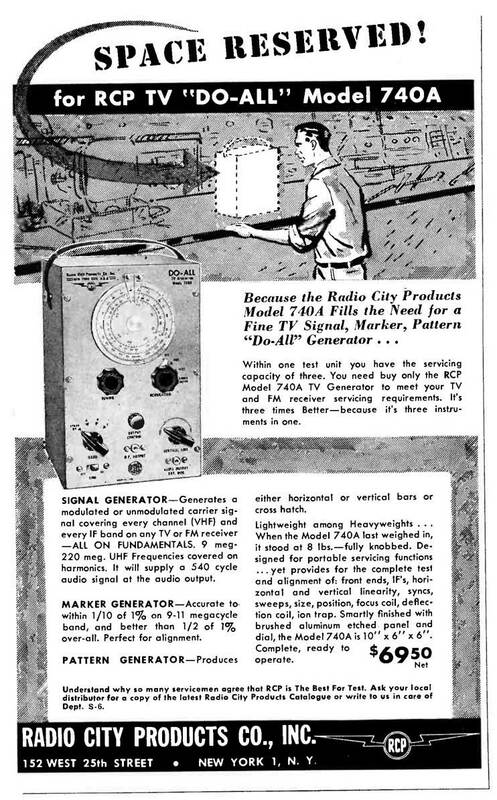 Richard E. Green has a webpage on Radio City products. 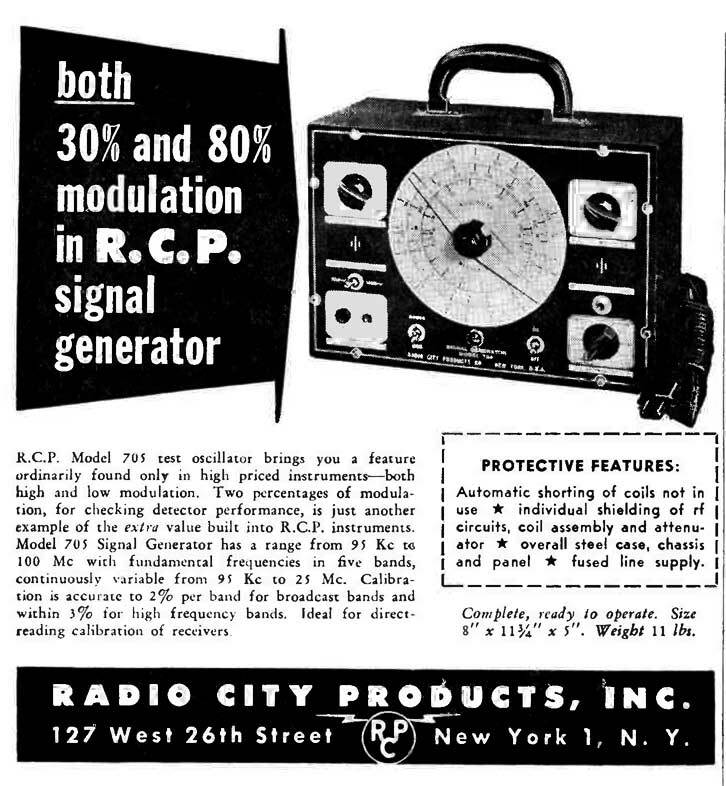 He cites mentions and ads for RCP in issues of Radio Craft, Radio Engineering, Radio News, Radio Today, and others. 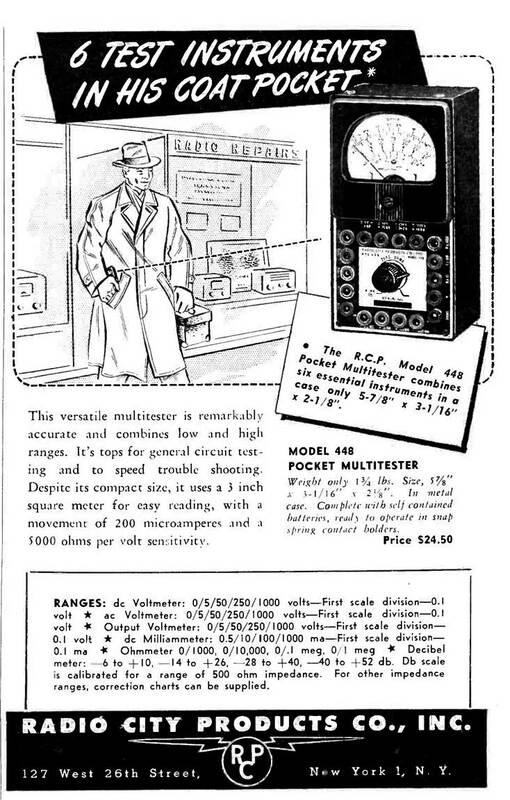 Issues of nearly all those magazines can be found at AmericanRadioHistory.com. 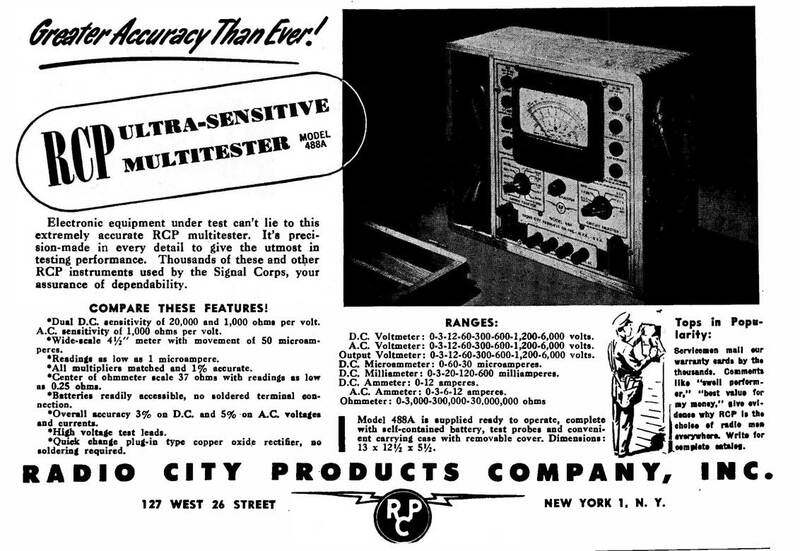 The earliest mention I can find is from Service's November 1932 issue (p.332), for RCP's "multidapter" product. 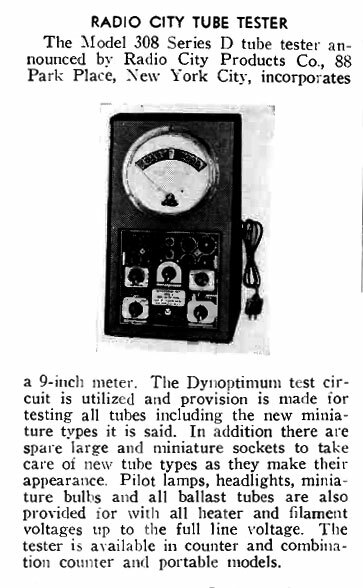 This was a tube-socket-and-wiring arrangment meant to allow earlier tube testers to work on more recent tubes. 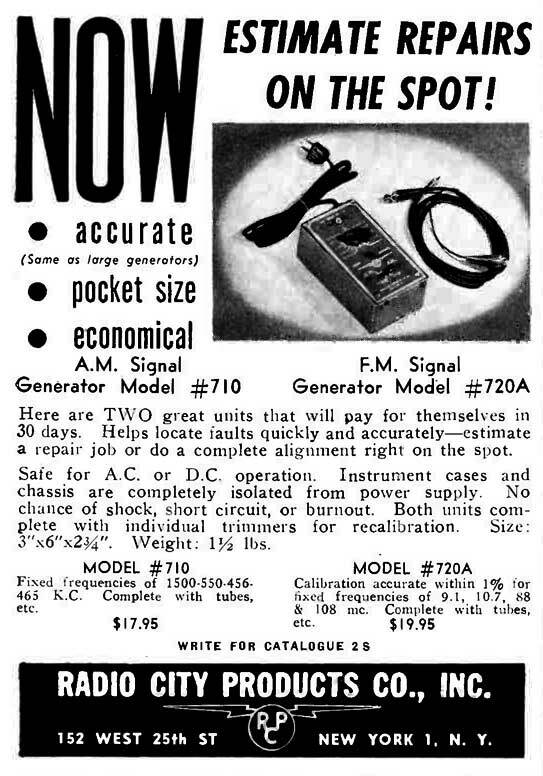 Later ads were usually for piece-parts: meter movements, shunts, switches and the like. 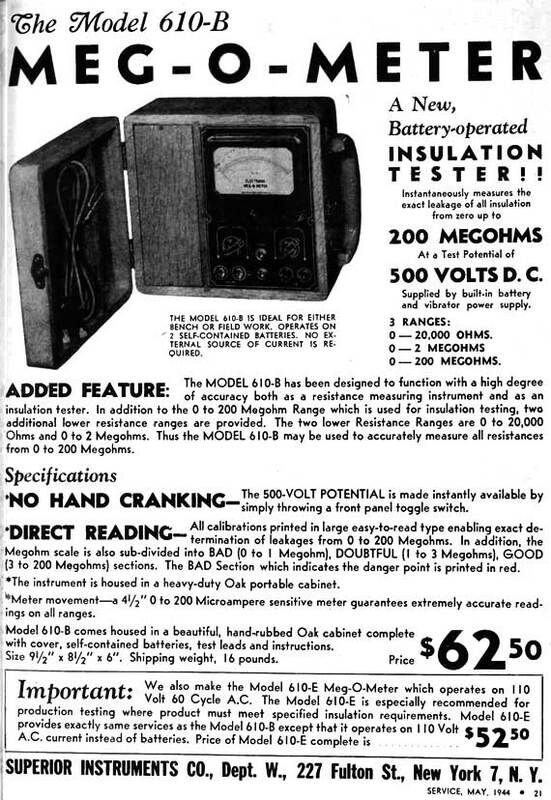 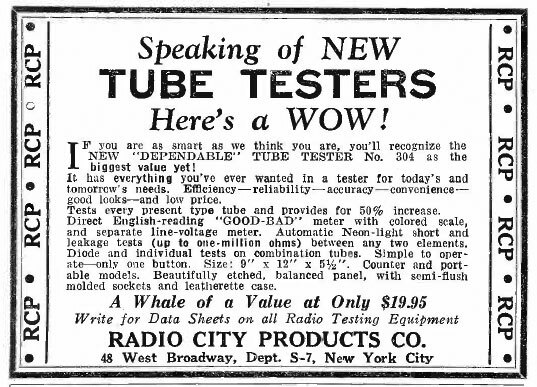 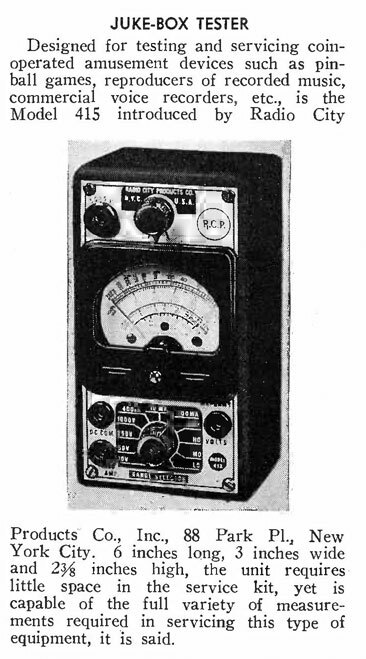 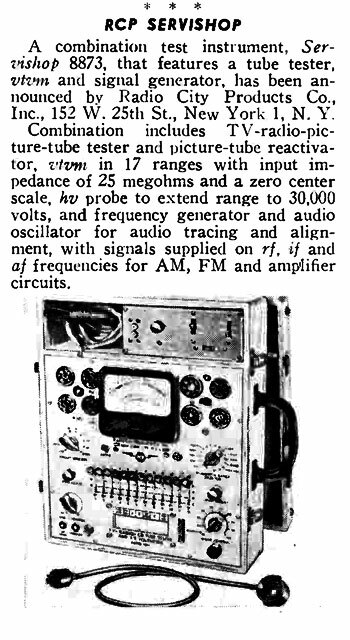 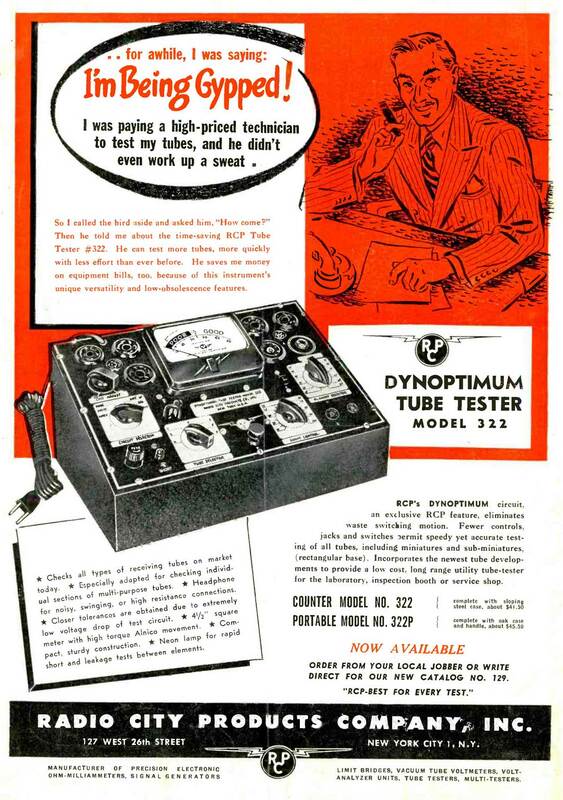 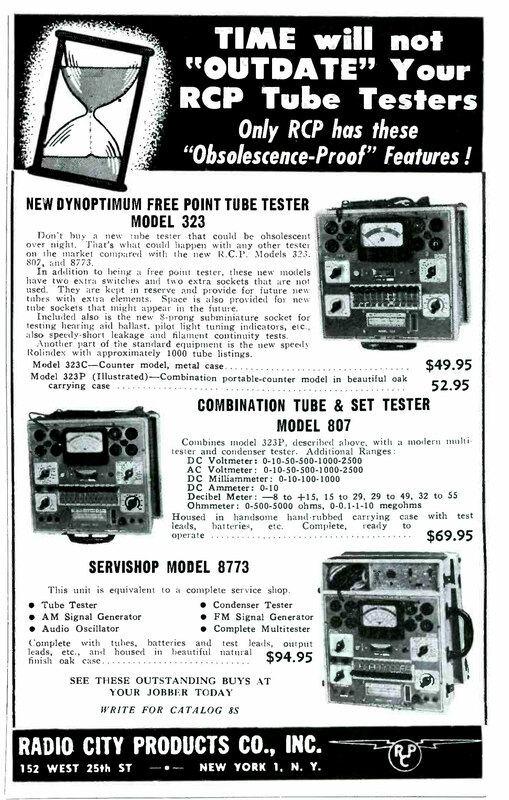 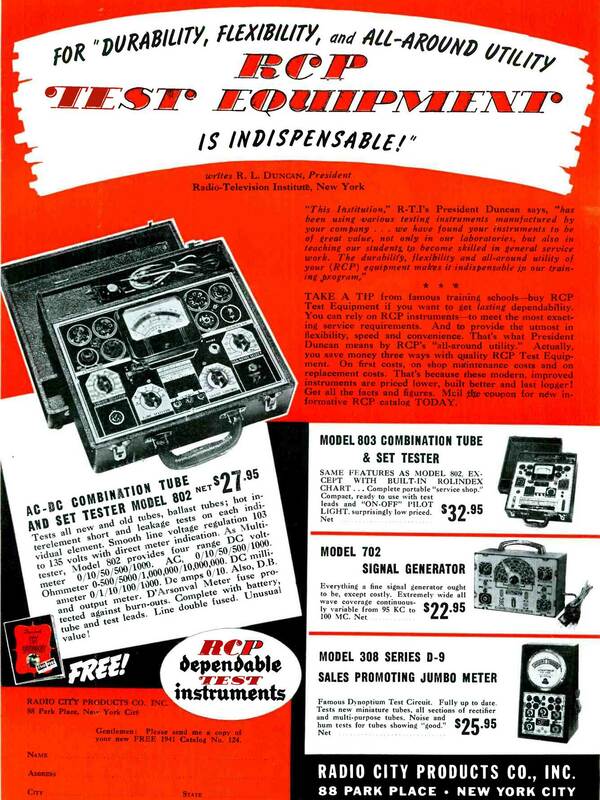 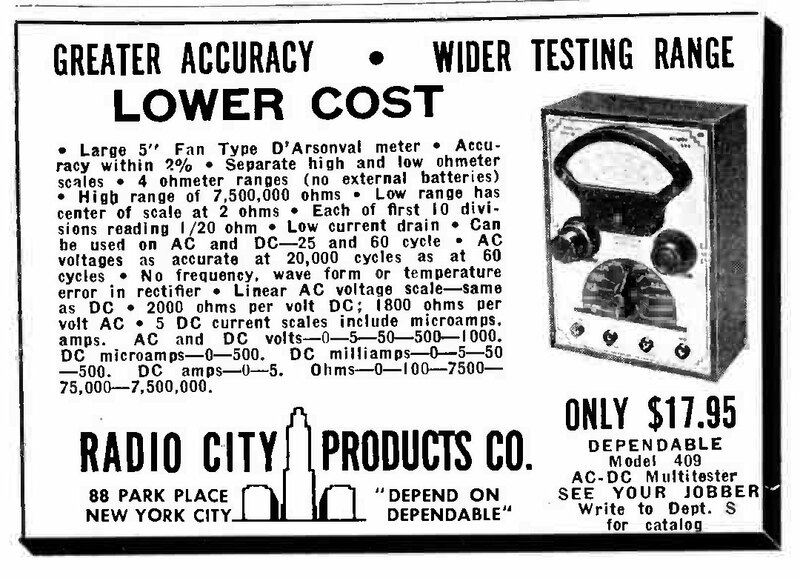 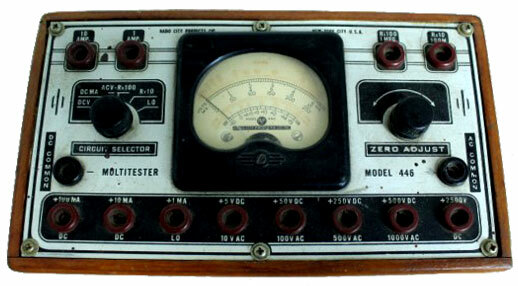 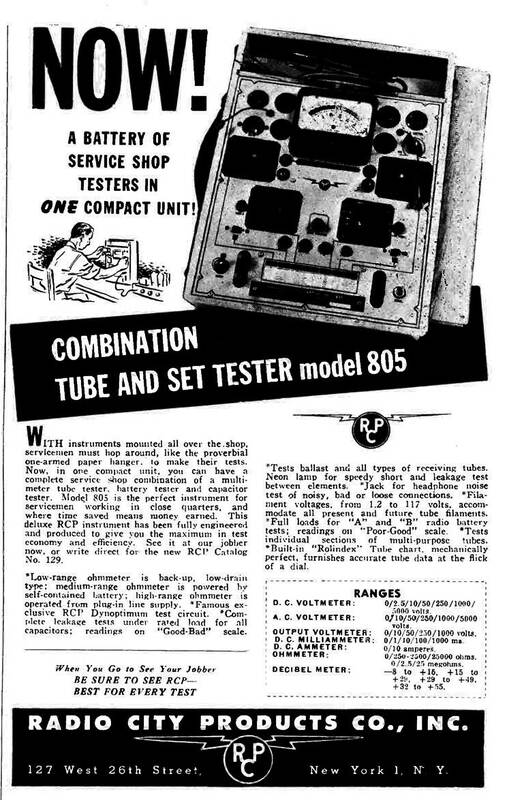 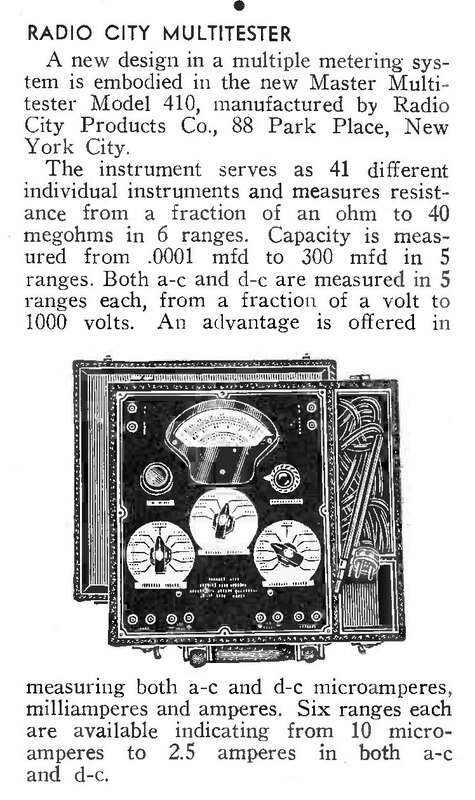 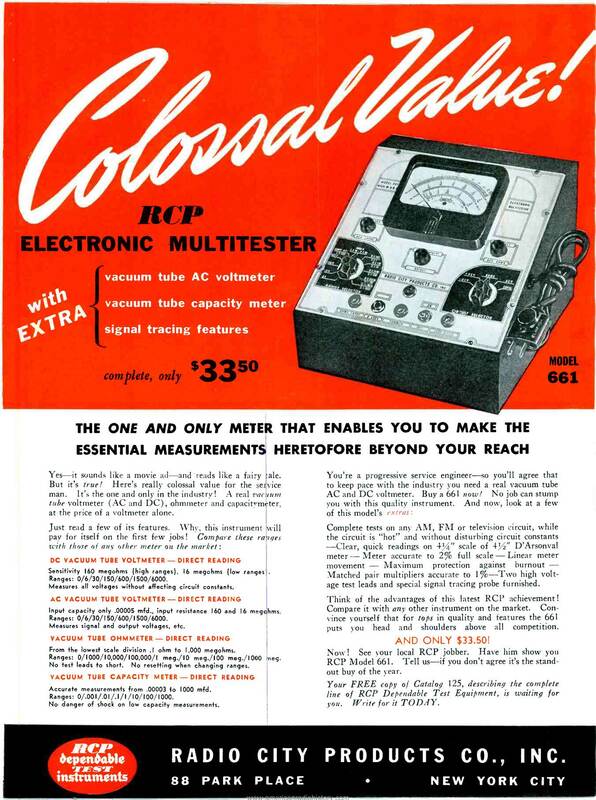 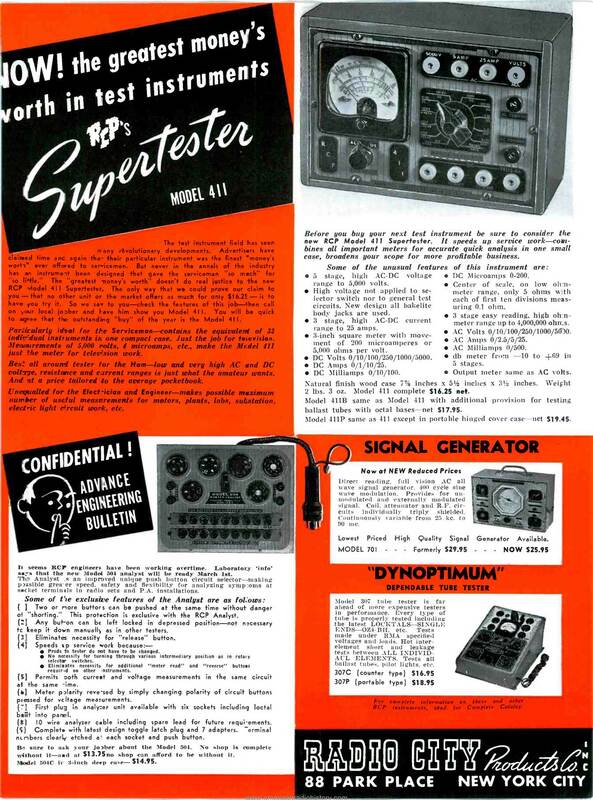 The first real piece of test equipment I've found advertised is the Model 304 Tube Tester (Service, July 1934, p.277). 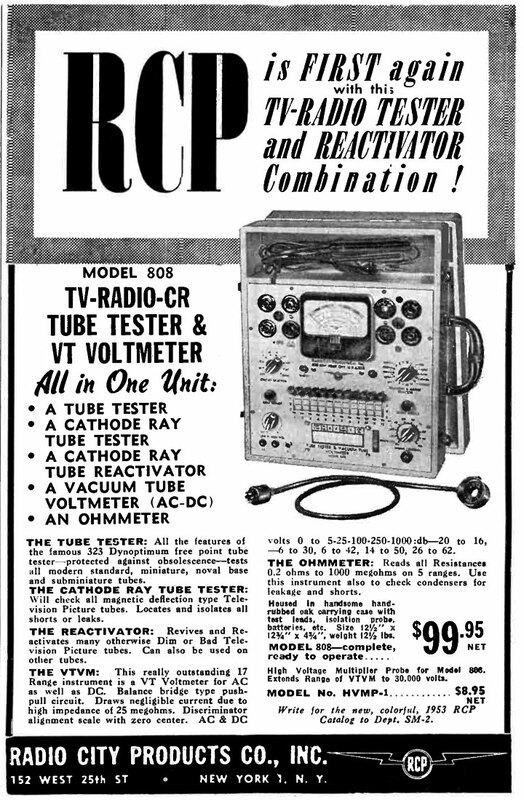 Throughout the 30s and the 40s, they churned out a lot of products, from simple VOMs to tube testers to test oscillators and oscilloscopes. 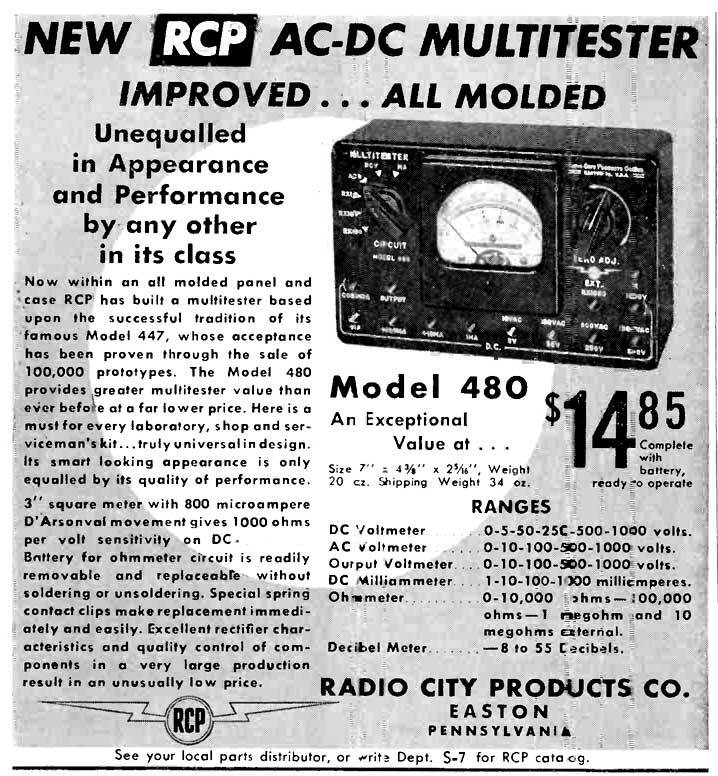 But it appears that every time Radio City made a revision to their product, they'd give it another model number and advertise it as new; I can't say how much difference there is between similar models (e.g. 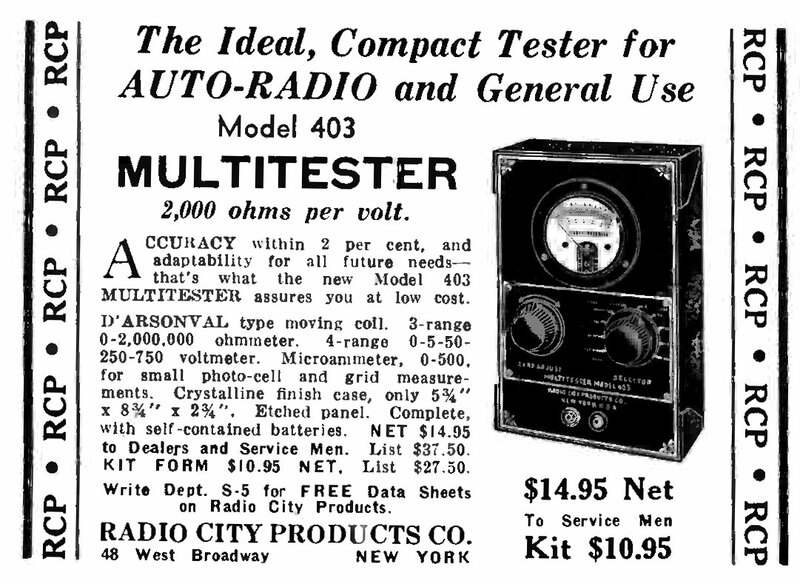 the Models 403 and 409 Multitester) because I don't own them and can't do a tear-down; but from the advertising I assume the differences are often small. 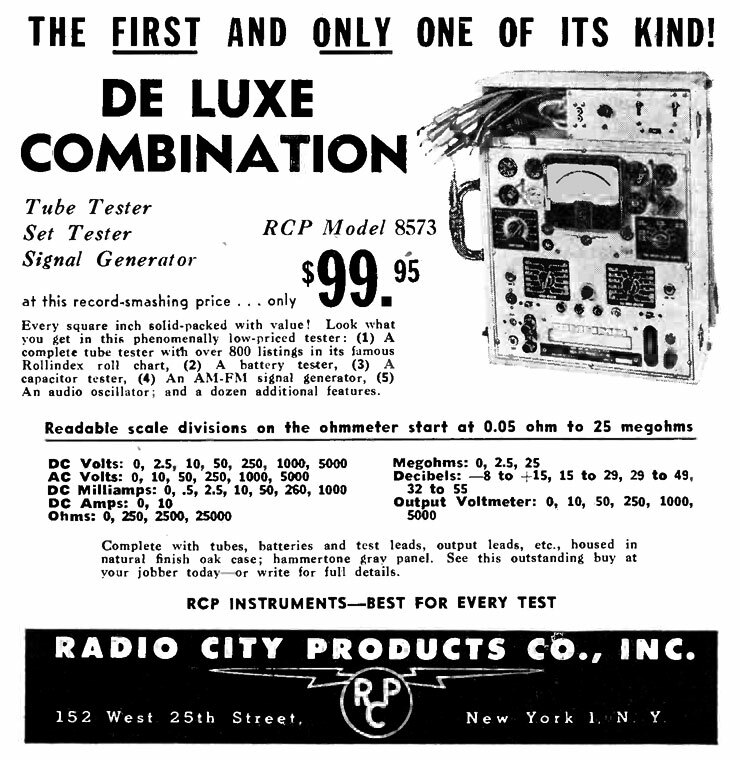 In some cases the advertising artwork for different products remains the same. 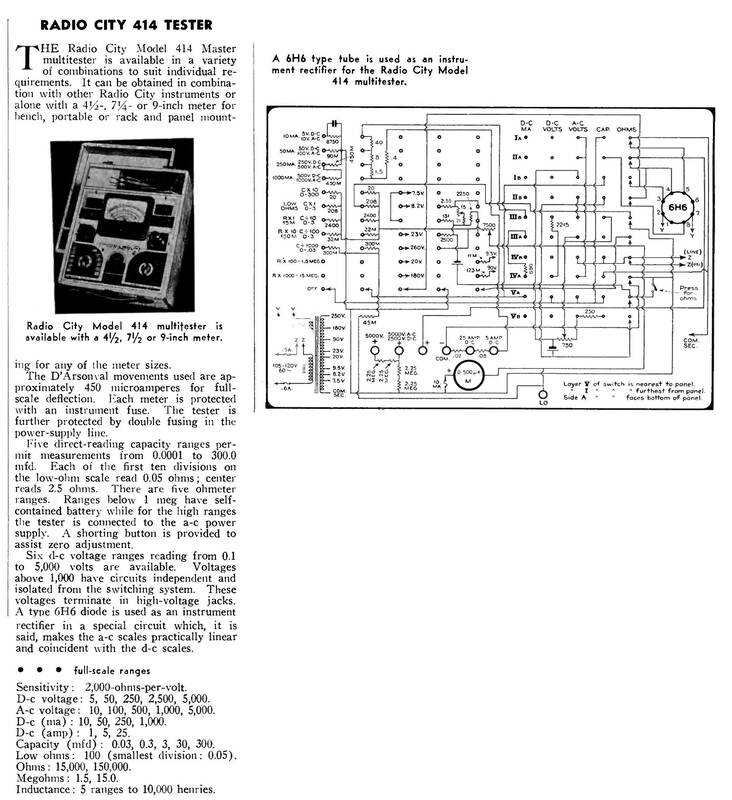 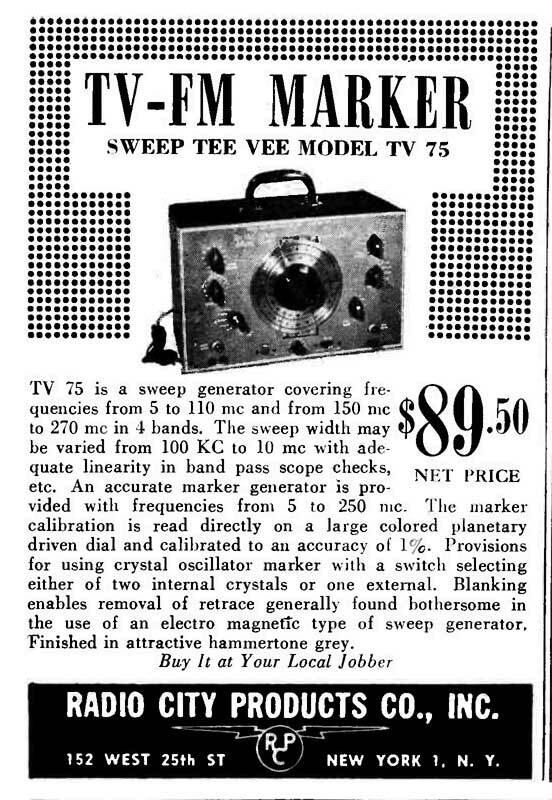 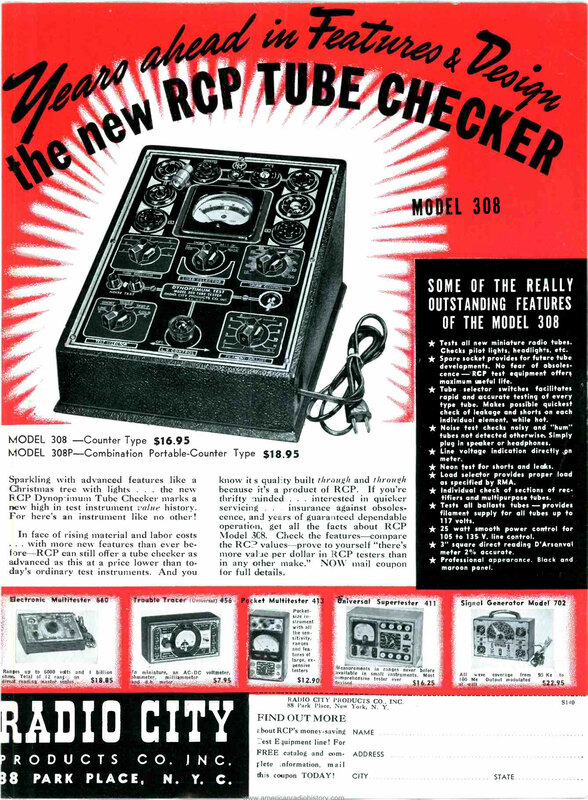 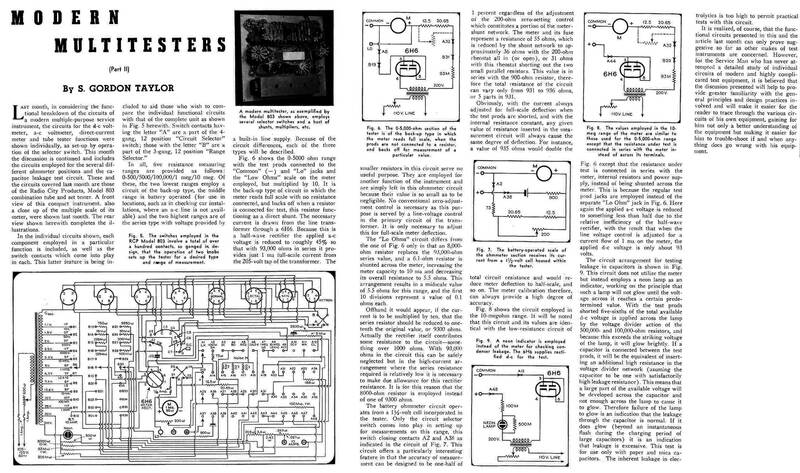 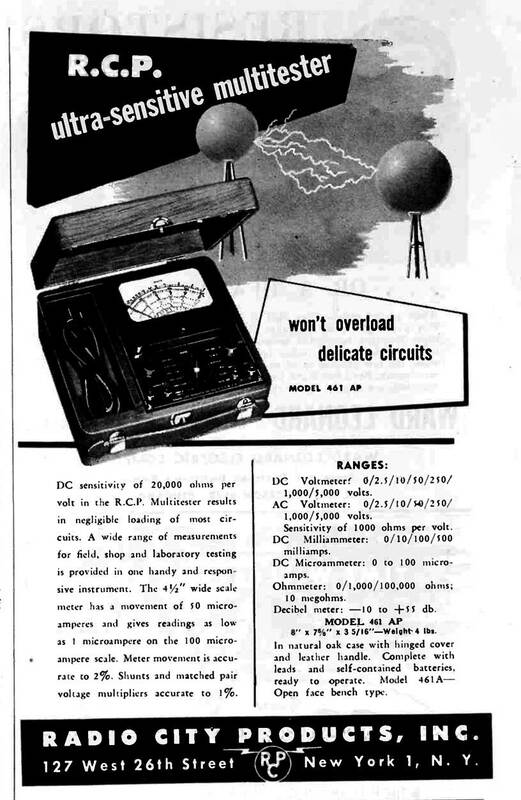 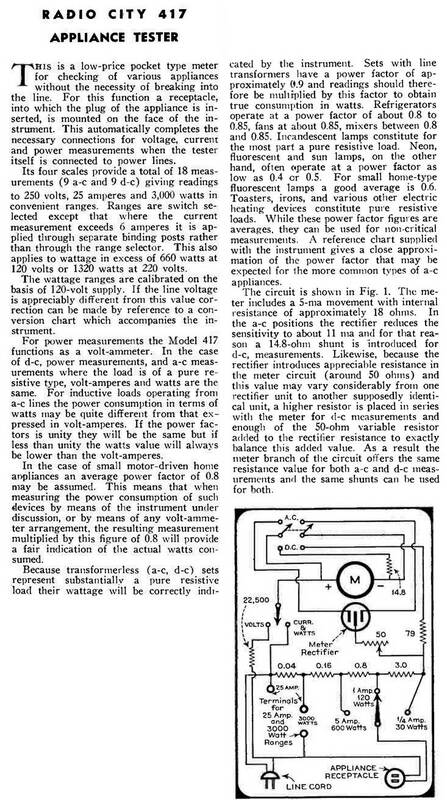 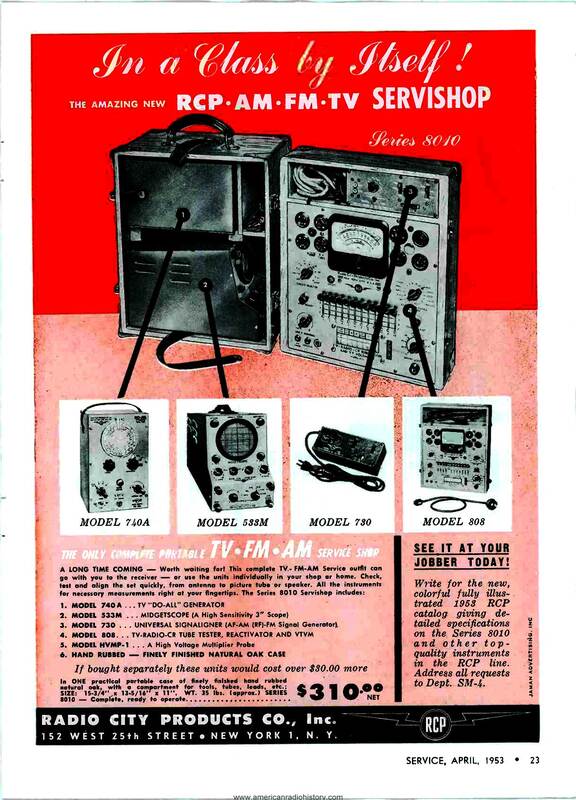 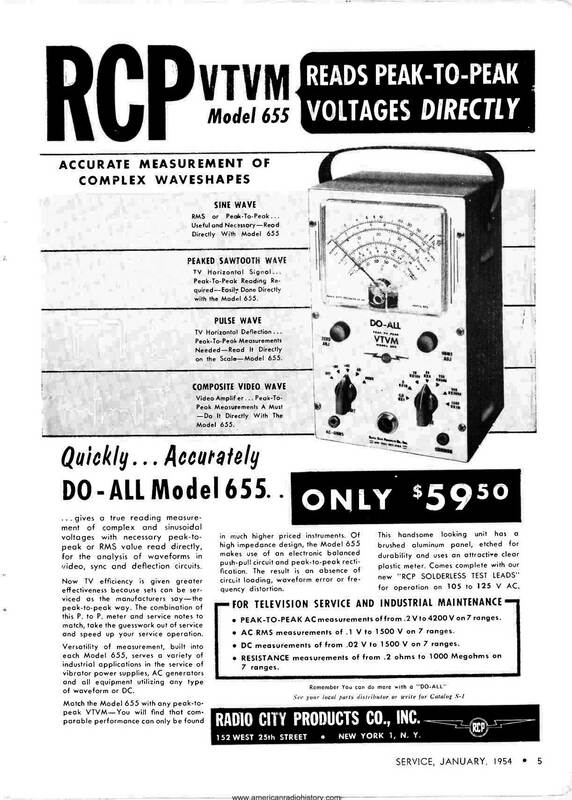 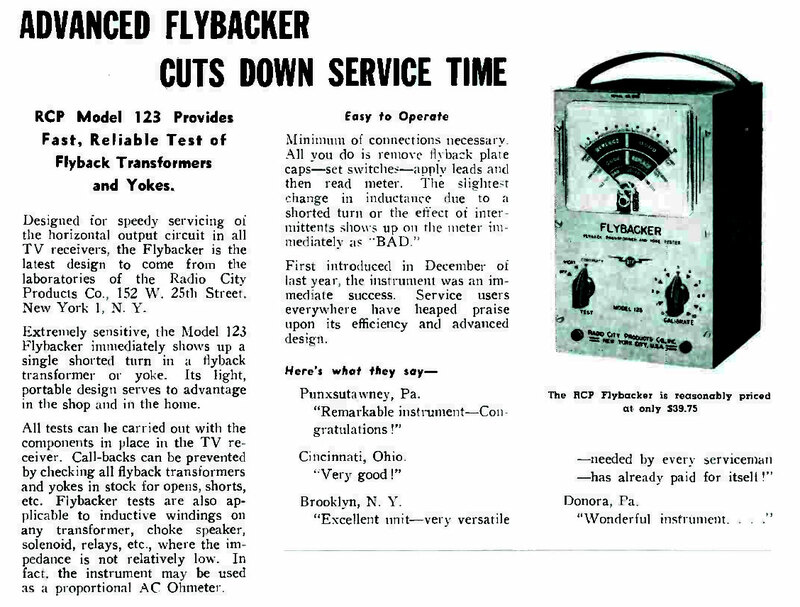 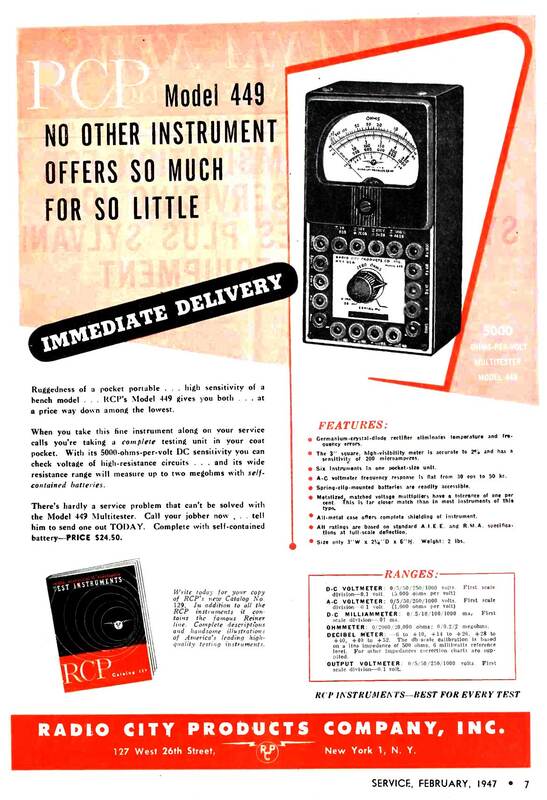 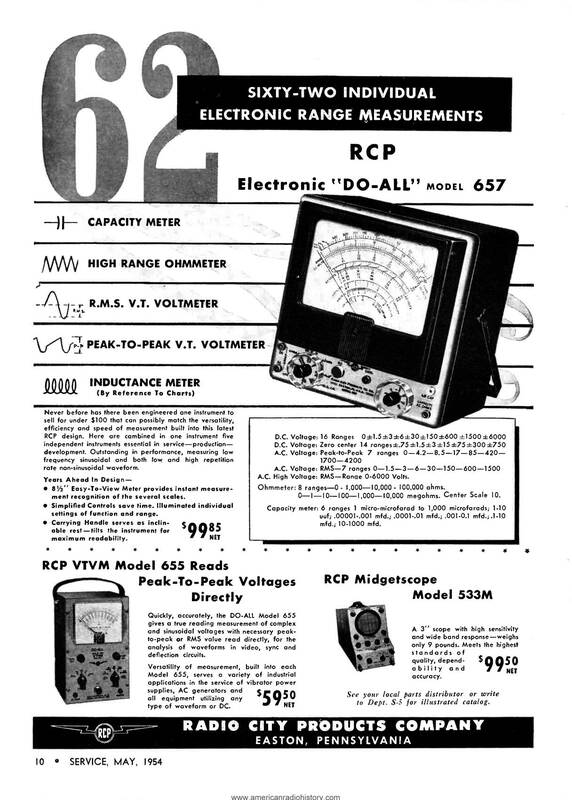 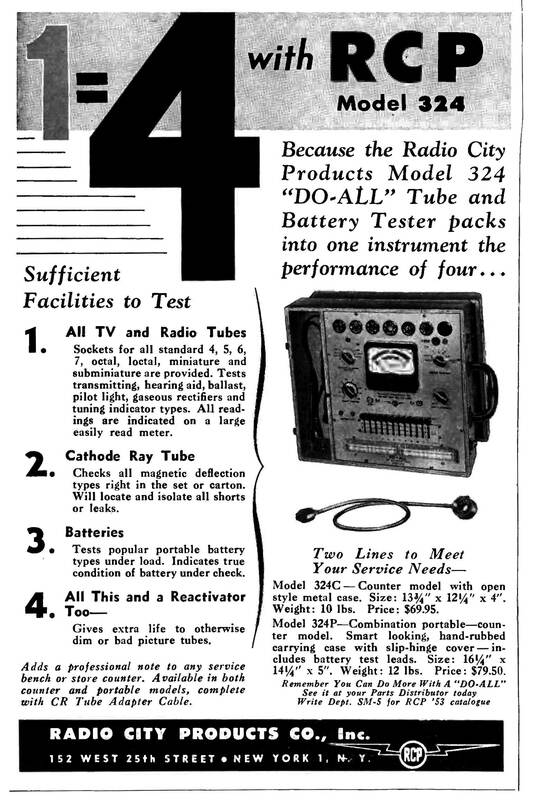 The last mention I've found for RCP is an advertisement for the Model 325 Tube and Transistor Tester (Service, March 1956 p.60). 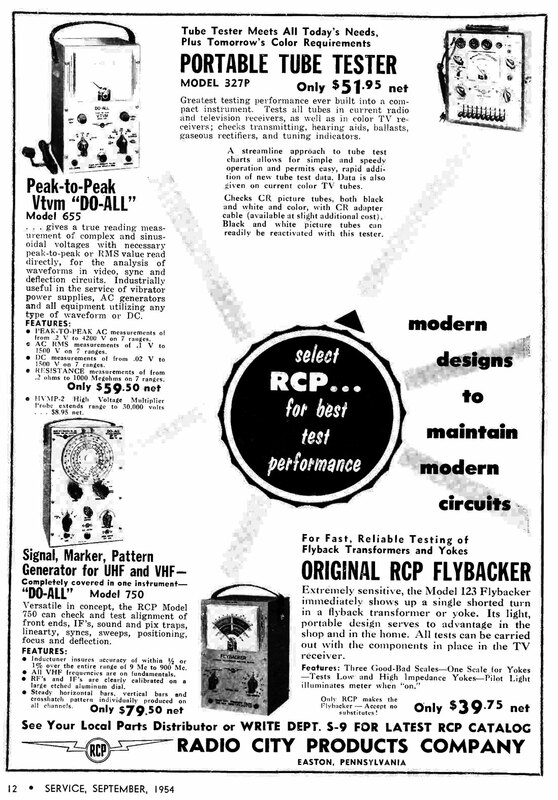 Press releases for the previous couple years mentioned that RCP had relocated from New York City to a new manufacturing plant in Easton, Pennsylvania. 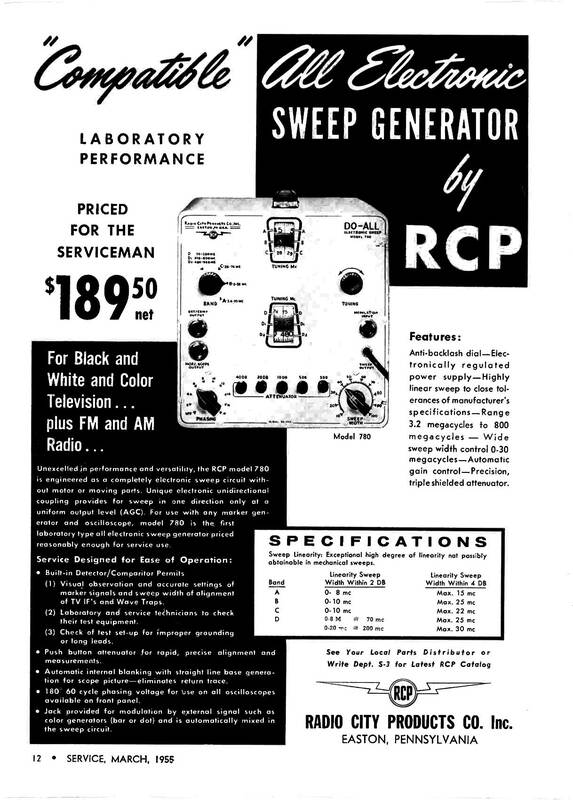 By now RCP was part of the Reiner Electronics Company. 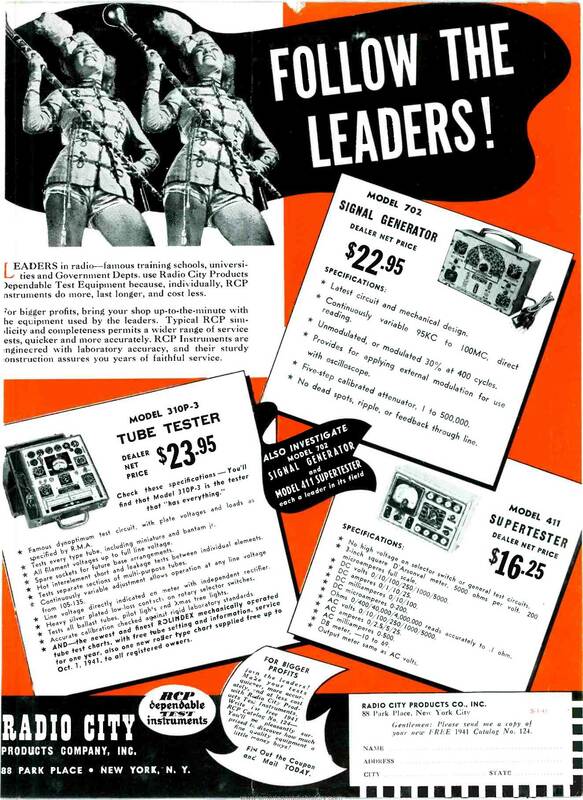 From there the trail goes cold. 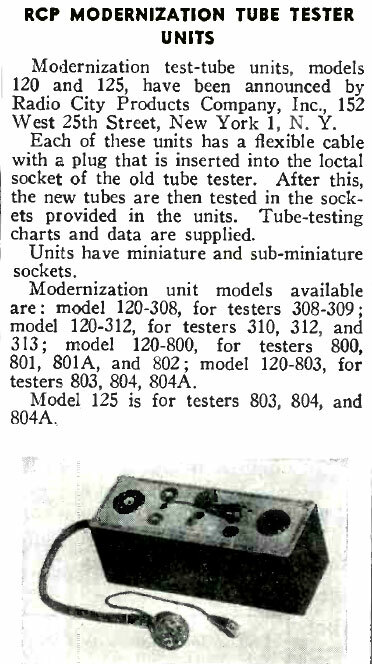 Equipment is listed in order by model number. 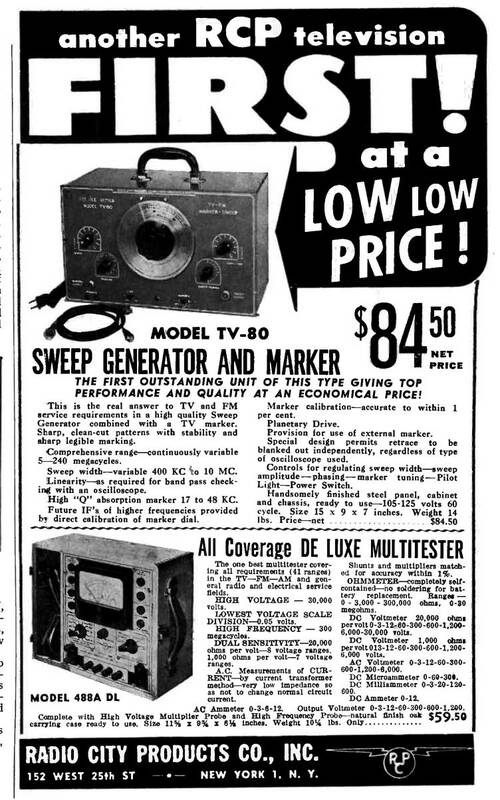 This is not a complete list; I come across models I've never seen before on places like eBay. 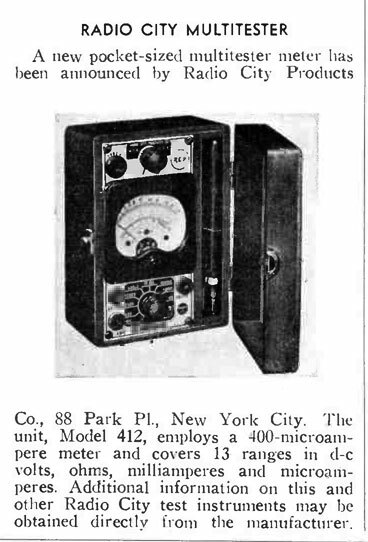 Letters following model names vary in their meanings, but usually P meant "portable"—the unit had a carrying case. 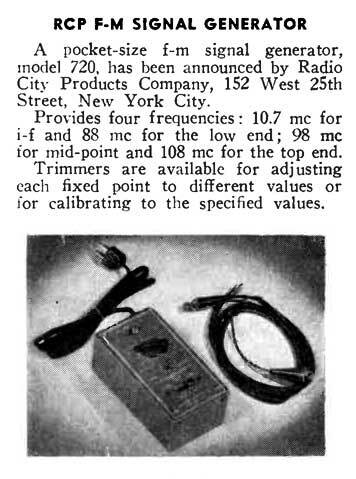 C models are often "countertop" types with the front panel set at an angle so it can be read more easily. 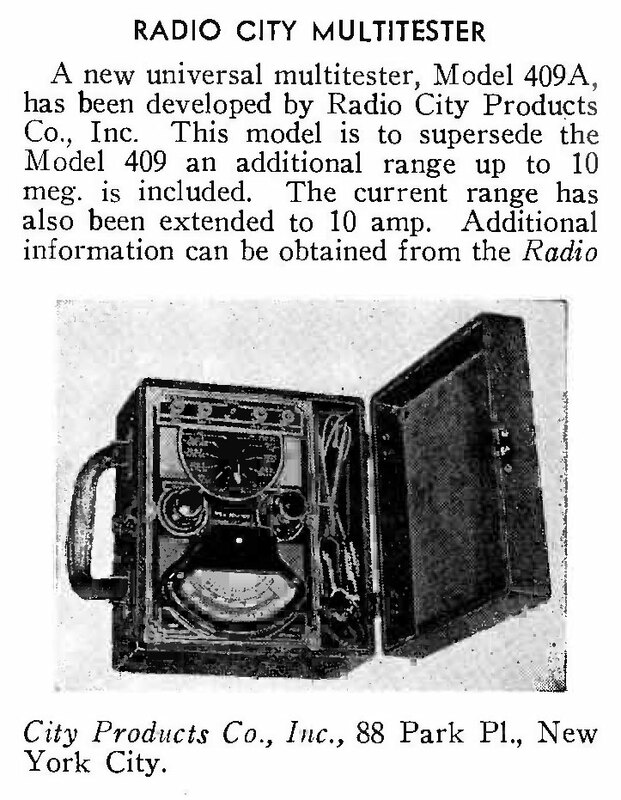 Some units were offered in several different styles at the same time. 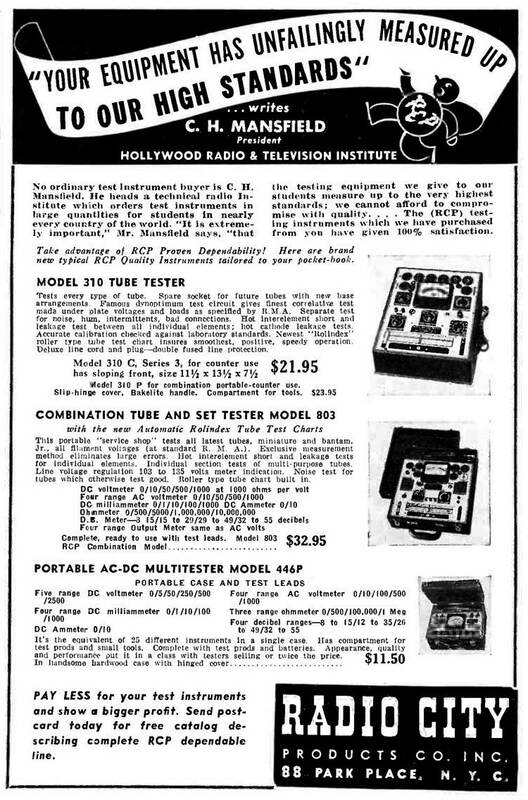 K designated kit versions.